I think it's safe to assume it isn't a zombie. We float over a planet as white forms appear, dismembered. They work their way from the outside in, everything pointing to the centre. That is where they come from – the middle of you. As the pieces come together, forming a word denoting, in the most basic of terms, The Other, we are enveloped in a steady and dark tension. This was Richard and Robert Greenberg's second major film project as a company, R/Greenberg Associates. The first, the teaser and opening title sequence to 1978’s Superman, gave them a start, but their second, Alien, established them as a creative voice. In this opening sequence, a disjointed version of Helvetica Black is used to instill a sense of foreboding, the letters broken into pieces, the space between them unsettling. This usage of type, in which letters are simultaneously message and medium, a lens through which ideas are both displayed and distorted, as structure and as obstruction, is a motif to which Title Designer Richard Greenberg would return again and again. 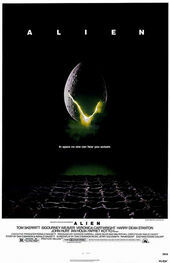 Title Designer RICHARD GREENBERG speaks about his work on Alien in this excerpt from our feature article R/Greenberg Associates: A Film Title Retrospective. So what came [after Superman]? Richard: Then Ridley [Scott] was doing this movie called Alien that was going to be a B-movie for Fox — he didn’t know how big it would be. Ridley had come out of British advertising and his work looked beautiful but he’d had no success with it. How did you go about designing those titles? Richard: The titles came from the idea of something “unsettling.” It’s disturbing to people to see those little bits of type coming on. I think Steve Frankfurt once said to me that sound is 50% of a film and I agree with that. So we abstracted the idea of the off-putting sound but in a typographic way. We wanted to set up tension and as these little bits come in, they seem very mechanical. We wanted to break the type apart using that letter-spaced sans serif, which really hadn’t been done in film before. When the bits finally resolve into a word, I think people weren’t prepared to read it as a title because of the spacing. Editor's Note: The typeface used was actually Helvetica Black. It looks sort of like Futura. Was it a custom typeface? Richard: It’s probably a slight variation on Futura, but it wasn’t custom. It was incredibly simple, but it struck a chord. Maybe because it was attached to one of the most frightening movies ever made! Alien really put Ridley on the map. It made a lot of money for 20th Century Fox, way more than they expected, and that led to other things, like R/GA designing the effects for Predator and our Academy Award nomination. We didn’t win because Spielberg had made a movie that year, and effects weren’t on anybody’s radar. It was the first award they would present at the Academy Awards just to get it out of the way. That’s all changed now. So similar to Superman, the Alien titles grew out of the marketing for the film. Richard: Yes. Steve and I created a teaser trailer that was just the egg and those letters and it really worked. It created a sense of foreboding. The teaser trailer was the creative touchpoint for the titles. Phil Gips was the art director. The trailer for Alien, just like Superman, had no voice-over. At the end it just had that copy line which is then repeated a million times: “In space no one can hear you scream.” That was written by the art director’s wife, Barbara Gips. Richard: Across the planet, correct. That grew out of the advertising, too. In that particular period of American filmmaking, from the late ’70s into the early ’80s, there were some attempts by studios to have the graphic nature of the advertising and the titles feel cohesive. That really dissipated later. Marketing has grown to the point where there are separate departments for everything and the process is more complicated. We tried to use techniques that were experimental for the time. Read more about Richard Greenberg's work in our feature article R/Greenberg Associates: A Film Title Retrospective. HELP KEEP ART OF THE TITLE GOING. BECOME A PATRON THROUGH PATREON.